Always up to standard and quality, and as usual arrived within 3 days of ordering. Very pleased. Do their job and fit perfectly. Always easy to change and durable. Highly recommend over normal supermarket bags. My elderly mother lives with us and uses incontinence pads. I ordered the small can but found it was too small for the purpose. However, the Code A liners are perfect for soiled pads. They are great when traveling. I ordered a larger can which uses Code C bags. The new can is perfect and she still uses the Code A liners for the soiled pads before disposing of them. I finally have the toilet area in my bathroom looking looking tidy and inconspicuous! They fit perfectly into my small bathroom basket and are so easy to put on and take off. Custom fitting and design make it more functional. But if you don't take time replacing liner, it balloons up inside the trash can ! HANDY SIZE WHICH HOLDS MORE THAN EXPECTED. BAGS FIT BIN NEATLY. Perfect size and convenient. Great for the bath. These fit so perfectly...so worth the money!! Shipped really fast too! Just thought I would comment on the Code A Bags I have been getting lately. I think these Bags have been changed they are not like the ones I use to receive. they seem to be cheaply made now, they break more often and leak at times. If these bags were changed I would hope you would go back to the old version which were better. I used to use plastic store bags in my small trash can. Naturally they didn't fit and many other associated problems. But simplehuman bags are great. They fit perfect. They are strong. Easy to pull out of the can without touching anything in the bag and stays tight in the can. When my current supply runs out I will definitely buy more of this product. Finally no more oversized bags. Perfect fit. Couldn't find bags this size for the longest. I have 2 garbage cans this size in the house so these really come in handy. Awesome product!! Terrific! Right fit and sturdy. like the cans, like the liners- but couldn't find anyone who sells them short of Simply Human, now we have a giant box (min order) so we are good for the next 10 years. Very useful. Love it that the pull tie closes the bag tightly. Ordered the SimpleHuman trash can from Bed Bath and Beyond but discovered the SimpleHuman website when I registered our product and have ordered other products directly from this website. I LOVE the trash liners as they fit perfectly with the trash can for our small bathroom! I'm always very satisfied with your products and your excellent service. Love my trash can liner bags! Love my trash can liner bags! Love my trash can liner bags! If you match the liner (by code) with the trash can, you will have a perfect fit! Like the convenience of having bags shipped to the house rather than driving around trying to find them to buy. I love the liners for my bin. They done leak when they are full. Will continue to purchase more as needed. Excellent product. I have three SimpleHuman cans, size A and size J, as well as a pet food container. The liners are a great poduct, fit the cans correctly,easy to insert and extract. Thank you for the efficient and handsome designs. I love this product, it keeps my bathroom neat with it's easy throw away bags, which I purchased also. Only draw back is the price. I cannot see why they cost so much. I bought this tiny trash can to use in my bathroom for the unglamorous job of holding used cat litter in between trash pickups (I live in an apartment and trash is picked up twice a week). The custom-sized liners are strong, easy to put in the can and remove; the "drawstring" secures the waste well, and the lid fits so tightly that there is no odor in my bathroom. I wish I'd thought of using this system years ago! I purchased the trash can to keep the waste from my cat's litter box until garbage day and this trash can was the perfect size & choice. I use it throughout the day, every day, and it's simple, practical, convenient and I love it! The trash can is made very well & looks nice too! And the custom fit liners are awesome! I only wish I would've bought this much sooner! I am pleased with the custom fit. It cuts down on waste on the parts of the bag hat is not being used. I like the way the bag fits perfect and is as strong as Glad bags.The bags look fantastic when right out of the container but once filled with trash looks awful. They fit the trash can well. They are easy to replace and easily disposed. Best Small Trash Can Liners! These liners fit perfectly. I use the daily in the bathroom. They are well made and look nice in the Simple Human trash can I purchased. The can liners are sturdy and well constructed. I would buy them again when needed. The liners are great. Fit the trash can perfectly and never rip or tear. My simplehuman trash cans look great in my two bathrooms and the liners fit perfectly. The cans are well made and easy to change the liners. The liners fit the trash can perfectly. Well constructed... sized exactly to specifications. Great product. Thank you. they fit the little pail perfectly. I really like the size and durability of the bags, but I can't get the top liner not to show, that it states. Minor issue, really like everything else. This product is very useful for the obvious garbage can of the correct size. I couldn't find any at my local store (be it that the store or the mfg backordered....I couldnt find them.) The very few I had left were replaced by a non-name brand that did the job, but not perfectly. I then took the few I had remaining and gave them to my husband for his pick up. They were the perfect size to attached to his gear shift on the column, a perfect, not fancy, trash bag. He has become very attached to them. Of course, as I order 30+ liners, the local store placed them on their shelves, after 6 months. The product it good, the right size for many functions....please keep them stocked, not backordered to local retailers. Thanks. My husband and I are big believers in composting and Simple Human container and liners make it really easy. The container is sturdy; the liners are snug and don't slip and slide like regular trash bags. No odor, no mess, definitely worth the investment ! Simplehuman may cost a little more than some but are worth every penny, all sizes I have used fit perfectly and don't split! I am so glad to have found Simplehuman to purchase this size of bag. It is not available in any store locally and I have 3 of these containers. Fits my can perfectly; strong enough to be filled with cat sand clumps. Ties shut to dispose. IT FITS PERFECTLY IN THE TRASH CAN. I love my Simple Human foot-controlled mini trash can. I keep it next to the kitty litter ready to receive scoopable clumps. The best part, the lid keeps odors locked-in until trash day. I bought the can at Bed Bath and Beyond and ordered replacement bags from Simple Human. The bags were reasonably priced, arrived quickly, and fit perfectly. I would not hesitate to try more Simple Human products. The product is neat , easy to use and simple to empty. It solves the open wastebasket problem. I'm impressed and pleased with the perfect fit of the simplehuman liner bag to my simplehuman stainless steal trash can. It's strong, and closes tightly with an efficient draw string close. Finally a way to have the trash can in the guest bathroom looking decent! No more thin liners that tear easily or grocery bags that look awkward. Trash can is small and easy to open. Difficult to find correct size trash line (A), so ordered them on line. Wish they came in black since I have a dark trash can. Buy it! Although they may work fine for home use, I have had complaints from our custodians at school that these liners are too difficult to put in the mini round trash can. They are a little small and must be stretched to get over the inner bucket. When you are changing 50 of these a day, you want the job to be a little easier. We’re sorry to hear about your problem. 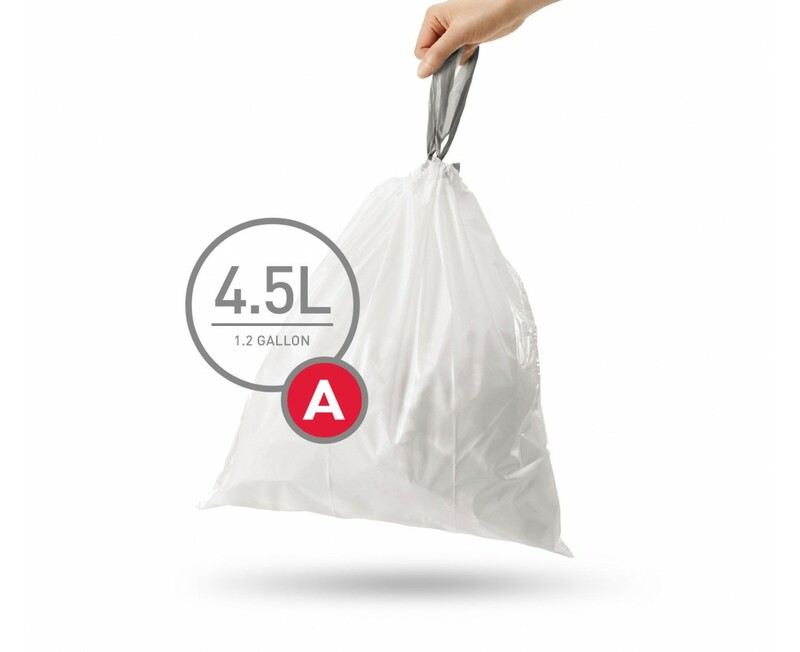 The code A liners should fit our 4.5L mini round trash cans perfectly. We stand behind our products 100%. A Customer Service Representative will contact you shortly to assist you with your problem. Fit perfectly in the can, once I figured out that you remove the inner liner, put the bag around that lip, the slide it back into the can. Good quality, and will probably last a while as I don't have to change the bag every time I empty the trash. It helped keep our puppies from ripping up the garbage everytime we were not around and it looks a lot more stylish than those plastic ones. These liners really ARE the best liners EVER! I know it sounds crazy to get so excited about trash can liners, but these fit the can exactly as they should. They aren't your standard "one size fits nothing" liners, that slop over the sides, or don't fit at all and end up tearing; these liners FIT. I use the size A in the can in the bathroom, and it is perfect. Plus, I can rely on the fact that only one liner will come out at a time, not 2 or 5 or some odd number that I have to figure out what to do with until I actually use them. I can put the package at the back of the cupboard, knowing that I will get just one liner at a time. Perfect! Smaller than you can normally buy in the stores and deeper with extra strength at the top. I use in my stainless steel bathroom wastebasket . I have two of your cans. I bought the bags thinking they would fit both my round can and my oval can. They do not. So I am a little disappointed. For the round can, the bags are great. It is so nice to have trash can liners that fit the can perfectly. Before purchasing simplehuman cans and liners we used the plastic bags from grocery shopping and they looked terrible and didn't fit well either. These liners are great! The size is prefect for the simplehuman deluxe mini round step trash cans – 4.5L / 1.2 gallon. I use these liners whenever I do my nails because of the chemicals I use, e.g., nail polish remover. This way the liner that comes with the trash can stay nice and clean. These liners are also durable. Fits the container very well, and never leaks. Packaging is convenient with each bag delivered thru the slot on side. These bags are great for simple human trash cans as well as other small trash cans, and they look so much neater than an old grocery bag. These trashbags fit the can perfectly and even tuck away so you can't see the excess bag hanging over the edge. These liners fit the Simplehuman step can perfectly. The drawstrings are very convenient, and they are very durable. The soap dispensor delivers as advertised. It adds a new demension to the act of "wash your hands" for everbody that uses it , kids as well as adualts. I do wish it came in a quantity somewhere between a package or two and this big carton. I live in New York and while I'd like to get more than a few packages of the liners at a time, buying a carton full becomes a storage space issue. The company needs to offer more than the current two quantity options. They fit is perfect! I bought them for my office and it's great! This is a well made plastic liner that fits the mini trash can perfectly. It's a little pricey, but I can't find any liner that fits better. Love my little step trash can but couldn't find any liners to fit it. Then I ordered the liners that simplehuman makes and found the pricing to be better than competitive with the big name makers! These little trash bags fit my Simple Human step can that I use in my bathroom. They fit the plastic can liner perfectly, and I love that they have the drawstring feature. Makes cleanup so 'simple'! I ordered liners from Simplehuman and paid for shipping only to receive rather ordinary wastebacket liners that I could have bought almost anywhere for a fraction of the cost. It is great having trash cans with liners. The retail stores I visited had either this liner or the other size liner I needed so I had been going to 2 different stores to get liners for my 2 different size trash cans. What a pain, online the stores in question did not carry any liners. I finally found this site and was able to get both in one place, no driving involved! This size A is a little tight and the B is a little big for the other can, but perfect other than that. Liners are very nice and fit the trash can well. These are Great!! Totally fit the superhuman pails they go with. Easy, convenient!! I put some pretty heavy stuff in there, no problem. The built-in tie is very good. Highly Recommend!! I purchased this trash can for the bathroom because of it's size and the lid. Now the puppy has no entry for pulling out the trash. The liners are a perfect fit for the cute trash can! They hide in the can better than anything else but it would be nice if they were completely hidden away when the lid is closed. I have purchased these bags for years and will continue to do so. fit trash containers perfectly. This little trash can goes just perfect in the bathroom. I like the convenience of the liners but the product just doesn't meet my expectations. Each individual bag is stuck together and needs to be opened. That wouldn't be an issue except, so far, every bag has torn around the top when opened. This is frustrating, and a waste of money. Thanks for letting us know about this, the bags shouldn't be tearing when you open them and it's rare that we see this happening. You may have received defective liners, in which case we'd be more than happy to replace them. Please contact our customer service team or visit the troubleshooting form on our website. We apologize for the inconvenience. The pack I got were all sealed shut and tore when I tried to pry them open. Despite this obvious defect I can't seem to get a refund. Stick to generic can liners. Where did you buy the product? Have you tried contacting our customer service? We apologize for what happened with the pump, and since it carries a two year warranty we'd be happy to replace any broken parts. Please contact our customer service for more information. Thank you. We are enjoying our simplehuman trash cans and liners. The cans are compact and efficient. The liners fit perfectly. Our dog can no longer help herself to tissues or other trash. Everyone is happy and healthier. I am very happy with the product. It arrived well packed and on time. I would have liked to buy from where we bought our dustbin ie, bed bath and beyond. I would appreciate if this is looked after that bin liners can be bought from the same shop. The liner fits very well Aand looks neat and clean.The dustbin is very pretty and nice for a small family to be in bathroom. Keeps Pets Out Of The Trash! I bought these SimpleHuman trash cans and liner bags to keep my dogs out of the trash cans in our house. My dogs loved to knock over the old open-top cans and look for things to chew on; now it is impossible! Great products here; highly recommend! We have a couple of the small round stainless steel trash cans with foot opener.......they work wonderfully & the bags fit perfect! We wouldn't even think about using another bag in them! I like the bags very much. They are strong and that was what I was looking for, as they are used in a room for an incontinent person. They are strong enough to keep the odors in.